You spy a symbol carved into the wall, flaring with witch-light as your gaze falls upon its ruinous form. Each Warrior must take a Fear Test as if against a group of Monsters with a Fear rating equal to (the DL + 4). Failure indicates that the Warrior Fears all of the Monsters encountered for the next 1d3 + 3 turns. In addition, immediately generate one set of Monsters for the current Dungeon Level and place them as normal. No Treasure is gained for completing this Dungeon Event, although take a Treasure Card as normal for defeating the Monsters. Select the number of random Warriors shown in the table below and deal the corresponding amount of damage. Damage dealt by the crossbow bolts ignores all armour except any headgear worn. The door behind you bursts open, and a tide of enemies pours through. Before you have time to draw breath, your blade is up, frantically parrying, as you try and recover from the shock of this unexpected assault. Generate a new batch of Monsters using the Monster Tables for the appropriate Battle Level. Place these Monsters in the usual way. All of the Monsters generated have the Ambush special rule may therefore attack immediately. Take a treasure card as normal if they are defeated. Pick a Warrior Counter and place a pit marker on that square. Remove the Warrior from the board and place them on a spare standard room board section (like the Well of Doom). They immediately suffer the damage listed below. Once this is done, place the Monsters from the table below corresponding to the Dungeon Level. The Warrior may fight the Monsters and find treasure normally, but the Warriors outside of the pit are unable to influence events in the pit and likewise the Warrior in the pit is unable to influence events above ground. This include the use of spells and and magic items! The Warrior may try and flee the pit at any time by climbing a few feet back up the chute and having a Warrior in an adjacent square to the pit marker throwing down a rope or using the Levitate spell. It takes one turn to leave the pit. If there are no Monsters left in the pit, then the Warrior in the pit may toss a rope up to the Warriors if he has one by passing an Initiative Test (7+), failure means that the Warrior must try again later. If there are still Monsters in the pit, the Warrior may not toss up a rope, but may exit using a provided rope by first passing an Initiative Test (8+). A Warrior in the chute may not attack at all, and is at +1 to be hit by Monsters in the pit. Take a Treasure Card if the creatures in the pit are slain. The floor of the chamber is slick with dark sticky oil. As the door swings open, a tinder block sparks, turning the floor of the chamber into a lethal conflagration. Each turn a model is on this board section, roll 1d6. On a 5+ their clothes catch fire and they suffer 1d3 damage with no modifiers this and each subsequent turn. To put the fire out, the Warrior must leave the board section and spend one whole turn beating out the flames. The flames burn in the chamber for 1d3+3 turns before running out of fuel. No treasure for completing this Event. The door in front of you is held shut with a stout chain and a rusty padlock. What secrets lie beyond this portal that are worth locking away? If the exit from this room is unexplored, then this door is padlocked shut. If there is only one doorway into this room, or all the exits have been explored, then choose a random unexplored doorway anywhere on the board to be the locked. You may either leave without opening the door, or you may try to open the lock. If any of the Warriors have Lock Tools or similar, then follow the rules for opening the lock as normal. To kick the door down, two Warriors in contact with the door must make a Strength Test (1d6 + Str, 7+ to pass). If both Warriors pass, then you manage to kick the door down and you may continue to explore normally. If a Warrior wants to try shooting the padlock, he may do so by making a successful BS roll To Hit using a Pistol or other powder-based weapon. There is a -1 To Hit penalty as you need to hit a very small area of the padlock from a safe enough distance. You must be at least 2 squares away from the lock to try this. A natural 1 on your To Hit dice results in one random Warrior on the same board section being hit by the wildly ricocheting shot. However, in any turn a Warrior attempts to kick the door through or shoot the lock, an Unexpected Event will happen in the next Power Phase on a Roll of a 1 or 2, as the Monster are attracted to the noise you are making! Once past the locked door, the next event that reveals Monsters will earn the Warriors an extra Treasure Card. Draw another Event Card immediately. You are assailed by an unbelievably rancid smell, which instantly makes you gag and retch. For as long as a Warrior remains on the current board section, they are at -1 Initiative and -1 To Hit in combat and when using missile weapons. The Monsters, however, must be used to the smell as they seem entirely unaffected by the powerful odour. No treasure gained for completing event. Draw another Event Card immediately. The cracked flagstone you are standing on gives way beneath you, dumping you into a shallow pit. Each Warrior should roll 1d6. The Warrior with the lowest score has set off the trap, and suffers 1d3 Wounds with no modifications. Place a pit marker on their square of the board. The pit is shallow enough that a man-sized creature or bigger will be able to climb out without using a rope. To do so, make a Strength Test (1d6+S, 7+ to pass). 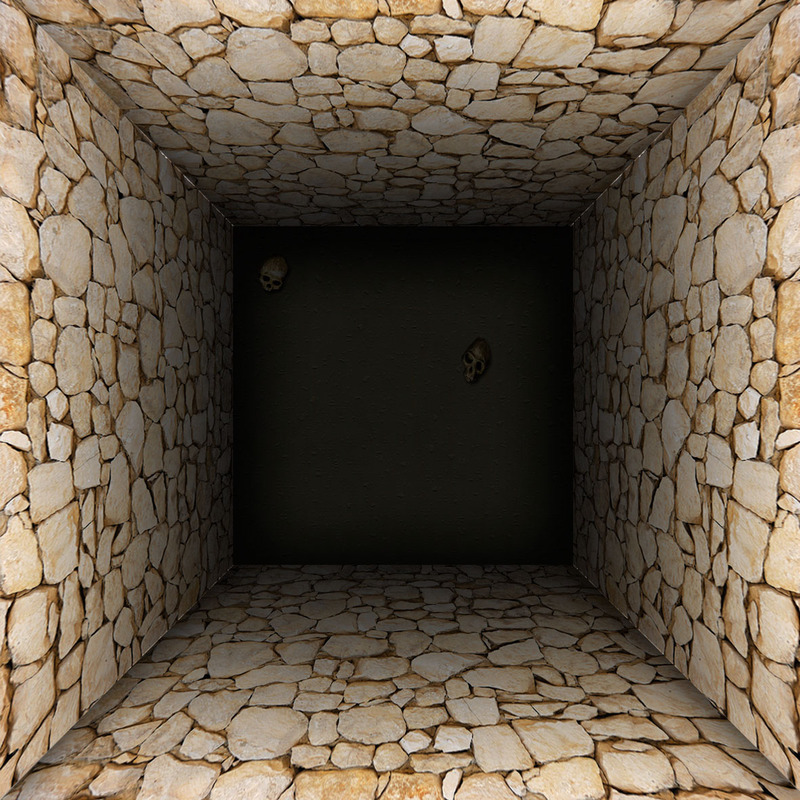 A pass indicates that they have climbed out of the pit, place them in an empty adjacent square. A fail indicates that they failed to climb out, and may try again next turn. Heralded by the moaning of tormented souls, the forms of several ghostly beings streak towards you, leaving no time to react. As the Lost Souls flood through the board section, 1d3 Lost Souls pass through each Warrior (roll separately for each Warrior). For each Lost Soul they come into contact with, the Warrior must pass a Fear Test as if against a foe with the Fear (Dungeon Level + 5). For example, a Level 1 Warrior who rolled 2 Lost Souls must make two Fear Tests against Fear 6. For each point a Warrior fails one of these special Fear Tests by, they loose 1 Wound with no deductions.